I was looking forward to a nice easy ride yesterday. We’d gone over 20 miles on Wednesday, and spent a long day in Salt Lake City on Thursday, so I figured we were deserving of a semi-rest day. So, when we left the house at 11:30 AM for Lower Stillwater Trailhead (along Rock Creek), I was sure our ride would be short. Didn’t work out that way. 18 miles, 3900 feet elevation gain is no piece of cake. Much of the 2-track/trail winds through aspens, then through a spruce forest higher up. Some parts are rocky, but many places are alluvial enough for trotting or cantering. A couple of troughs, a running creek, and Rock Lake provided ample water for Daisy and the horses. Daisy took a swim in a trough and had a refreshing dip in Rock Lake. From the top, the 360 views of the Uintas were amazing, a nice reward for the uphill climb. The humans appreciated it. I'm not sure about Daisy and the horses. After 5 and a half hours in the saddle with an hour and half or so of breaks along the way, we returned to the trailer about 7:30PM, a long ride day. 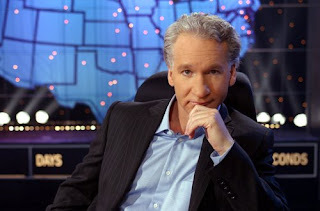 The drive home was about 45 minutes, so we arrived just in time to cook up some frozen lasagna and collapse in front of the tube to watch Real Time with Bill Maher, my favorite show. Today, we get a rest. I insist. Want To Adopt a Baby Elk? For Steve’s birthday ride, we returned to the end of the Pigeon Water Spring Road, followed the trail to Dry Canyon Ridge and then up toward Tworoose Pass. The cows have been brought down to the water troughs between nine and ten thousand feet. Daisy tried to play with the calves, as usual, but the mama cows weren’t cooperative. As we continued up through the aspen groves, we noted that some aspen leaves were changing beginning about 9800 feet. Won’t be long before fall arrives at that altitude. Between aspen groves, Daisy routed a baby elk out of the sage. (photo from internet. I didn't have the presence of mind to pull out my camera) As it ran off bleating, we thought Mom would surely appear and chase Daisy away, possibly to our dog’s peril. But Mom didn’t show up and Daisy gave up the chase within a couple of minutes. The poor little elk calf couldn’t have been more than 3 months old. It still had spots and seemed terrified. 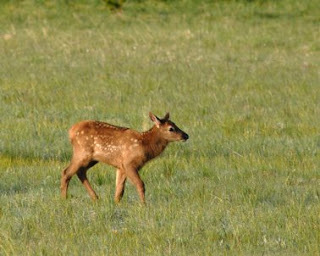 Since it was all alone, we assumed it was somehow orphaned, maybe by antlerless hunting season, which started last week. Or perhaps it had become separated from the herd somehow. Its pitiful cries made us wish we could gather it up and take it home. Of course, even if we could have done that, we couldn’t keep a grown elk in the pasture, and once it was used to people, it wouldn’t last through the hunting season in the wild. Still, we felt for the scared, lost baby. We climbed to the top of Duck Mountain, where a communication tower is located at 11, 500 feet. During the climb, we looked down into the lakes of Duck Basin: From up top, we could see the ridgeline of the High Uintas. Just below the communication tower was a grouping of dwarf firs that Steve says is called the Krumholtz. Note the resin-covered, upright cones on the firs. The weather was perfect. Temp was about 65 degrees when we started out at 9:30AM at around 8000 feet, and 77 degrees when we returned to the truck at 5:30 PM. Up high, of course, the temp probably never rose above the sixties. A stiff breeze (maybe 20mph) kept us and the horses cool. Some of the high meadows are gently sloping and ideal for trotting and cantering. The aspen forests will be even more beautiful in a couple of weeks when the leaves change. With the trailhead located only 45 minutes from our home base in Roosevelt, this is one to remember and repeat often. The views are spectacular. Overall, the ride was 21 miles, 5200 feet elevation gain. Although we were out for about 8 hours, much of that was gawking and taking photos. Actual riding time was just over 6 hours. Monday morning started out clear, barely a cloud in the sky. 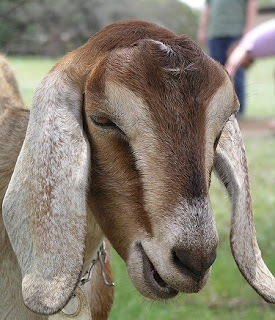 While we were saddling for a ride along Reader Creek, Boss became nervous, calling our attention to a man with 6 belled goats who was walking in a nearby meadow. Boss became so nervous, in fact, that he panicked, broke a tie ring on the trailer, and ran off. Daisy followed him over a hillock. Steve followed them both. After a few minutes, both Boss and Daisy came trotting back. We assume Boss realized running off was no good. He was probably imaging the scary Bigfoot Goats chasing him into the woods. Maybe Daisy calmed him down and gave him the confidence to return. After that mishap, we decided to lead the horses over to the goats and introduce them. The goats’ owner, who uses them as pack animals, was very accommodating. He held one of the goats while the horses tentatively sniffed it. Mischief wasn’t too impressed. Boss very tentatively put his nose down, as if afraid the big bad goat would get him at any moment. I wonder if he still associates goats with bears, since he smelled bear once and then saw some mountain goats. At any rate, he seemed to accept them after he put his nose on them, and all became good with him and goats. We stayed and talked to the goat man for awhile, an interesting fellow who had been all over the state with his unusual pack animals. We finished saddling, more successfully this time, and started out at about 10. We rode upstream on Reader Creek, following a cairned trail to the pass above Taylor Lake. We saw harebells (above right), bog gentian, cinquefoil, and more grey-leaf willow, some of these with seed pods. A helicopter was flying up and down reader creek area during the time we were riding. There must be a search going on, but we haven’t heard who was missing. We achieved the pass by noon. The views were lovely. On the way down, we stopped at one of Reader Creek’s cascades. Daisy fetched sticks and we enjoyed a moment's rest. She looks like she's about to try out her own slippy-slide here: By 1PM, the sky was cloudy. We reached the trailer a little before 2, having ridden close to 10 miles, with 1200 feet elevation gain. Just as we loaded the horses, we heard the first clap of thunder. Our ride had much better timing on this second day out. Who's the Optimist at NOAA? For the past week, the weather has been stormy over the mountains in the afternoons, in spite of consistent NOAA weather predictions, as of that morning, of only a 20% chance of rain. On Sunday, with the prediction again for 20% chance of rain, we hoped we'd hit the 80% that was supposed to be rain-free. We trailered up the Elkhorn Loop and then to the Chepeta Lake trailhead. About 11, we got started on a ride on the trail toward Whitereocks Lake. We saw some hikers and a group on mules just as we crossed the Whiterocks River, but had no company after that. Near the creek and in meadows, we saw lots of what we think is a Grey-leaf willow (right), and some mountain harebells. Much of the trail wound through spruce trees and was very rocky. We’d started out without our Easyboot Bares, but soon decided to put them on. Unfortunately, NOAA had mis-underestimated (in Bush-speak) their forecast again. The sky clouded up by 12, and by 1, we were having lightning and loud claps of thunder every couple of minutes. The rain came down. Not hard, but enough to get us damp in spite of our dusters and other gear. The temperature dropped, too, making it fairly unpleasant. With no sign of clearing, we decided the better part of valor was to head for the trailer. Fortunately, most of our trek was through trees, so we had good cover. This photo shows a tree that had been struck by lightning recently, maybe in the past week. It literally exploded into shards (I'm holding one of the pieces) and splinters that were splattered over the ground for a 150 foot radius. Pretty impressive force. Maybe riding in the trees wasn’t such good protection from the storm after all. Steve bought a tribal fishing license today and we took a little jaunt to Rock Creek. We identified a black hawthorn bush/tree, thorns and all. I noticed it when it snagged me as I got out of the truck. Steve caught a few brown trout. Daisy learned what fish are. After exploring a couple of catches, she wasn’t that interested. Back at home, we chilled out and enjoyed a beautiful sunset. Daisy Mae sure knows how to un-lax. (like re-lax, but more so.) She lies on her porch blanket in the evening, enjoying the sunset. Her preference is to stay out until the last glow is gone. Even if invited inside at, say, 8:45, she declines. After all, there’s still a bit of light on the horizon and she's releasing a day's grasshopper-hunting tensions by lazing in the cool country twilight, thank you very much. As soon as it’s pitch dark, just a little past nine, she scratches on the door, ready to hit her indoor doggie bed, on her own time, of course. Ah, if only we could all live the free and easy life of a spoiled rotten yellow lab. I put stall mats in the front of our horses’ lean-to last winter. The idea was to provide a clean surface and thus keep the horses from consuming so much dirt along with their hay . We thought of building a trough, but I figured they’d throw the hay out of that, too. Anyway, feeding on the stall mats worked very well. I even used old kitchen carpet around the mats to keep stray dirt from getting kicked onto the feeding area. The carpet lost its stiffness after awhile, though, and kept getting turned over. So this year, I’ve added another set of mats, using just a few carpet pieces in places the mats don’t cover. Right now we still have plenty of grass in the pasture, but when it’s time to feed in the barn, we’re all set. The horses will be eating in style this year. Mischief, want to give me a thank-you kiss? We had no hunter orange, and it was the first day of some kind of hunting season. We realized both points immediately when we saw all the trucks, trailers, and 4 wheelers at our trailhead. On this cooler than usual Saturday, we had trailered our horses to the Pigeon Water Spring road, parking at same spot we used last week to approach Dry Ridge. Of course, then, no one was around. And now… well, lets just say we were glad we weren’t elk and sure hoped no one thought we were. After scrounging around in the trailer tack room, we came up with one orange vest and an orange hat for Steve to wear since he would lead, a red sleeping bag stuff sack to tie around Boss’s elk-colored hide, pieces of red mechanic rag to tie to Daisy’s collar, , and a poncho made from a part of a horse blanket for me. Better than nothing. Thus, we braved what we figured were the elk bow hunters and set out. Steve had also forgotten his saddle bags, so he had to carry a backpack with his gear. Hmm, we really hadn’t prepared very well. Maybe that was because we’d been on so many other trips on Steve’s week off that our minds were running at least seven days behind? Instead of riding up the eastern ridge as we did last week, we followed the road this time and came to a narrow, steep, rocky path’s descent into Dry Creek’s valley. From there, we rode along an alluvial two- track lined with sage, ripe serviceberry (when really ripe, these black berries have a hint of sweetness, but are otherwise pretty bland), and birch leaf mahogany until we reached a Forest Service sign pointing up the western hills toward Dry Canyon Ridge. Again, the path was narrow, steep and rocky, but not difficult to follow. On top of the ridge, the going was easier, again turning into a faint 2 track. When we started at 11 AM, temperature 55 degrees at 8200 feet, the sky was mostly blue. As we began our trek along the ridge, dark clouds moved in. Since we had no tree cover or anything to hide beneath up there, we went back down to the valley from which we’d come. On the way down, we ran across a couple of cowboys with a pack horse and an extra saddle horse. One of the guys said he had cows up that road in the high country. He planned to move them down lower in the next couple of weeks. The cowboys didn’t seem worried about lightning or rain. We descended again to Dry Creek (no water, just a shallow gulch) and watched the sky. Lo and behold, a bit of blue broke out. After some consideration, we decided to try it again. Up we went, much to our mounts’ dismay. They weren’t real happy about climbing those rocks again. The weather held out. We followed the ridge for about 5 miles. Out in the open on the ridge, the views were amazing. The terrain was dry, with sage, native grasses and a few wildflowers: lupine, bouquets of pearly everlasting, and yellow broom snakeweed. We also saw this pretty pink flower, unknown to us. Our flower books haven't helped in ID. Anyone know what it is? After a mile or so on the open ridge, the trail led in and out of aspen groves. Note Daisy seeking shade or comfort under Boss's tail. As we were weaving through aspens, we again met the cowboys. Another guy had joined them (now riding the extra saddle horse) with a compound bow and arrows in hand. Obviously, he’d been hunting. I was glad for my red poncho, for what little good it might have done. Ranchers with forest service grazing leases have run a pipe down from a high spring to a series of water troughs. A drink came in very handy for Daisy Mae and the horses, who were ready for refreshment by the time we reached the first trough. Daisy stood on her hind legs and drank out of the trough instead of slurping the muddy runoff on the ground. That was the first time she’d tried that. I didn’t get a picture then, but here she is lapping it up from the next trough we came to, where she could drink while standing on all fours. We turned back at about 3PM, figuring all of us would be tired by the time we got home. The total ride was 13 miles with 3600 feet elevation gain, in 5 hours of actual riding time. That made a good day’s work for the boys. Even Daisy was tired. Briefly. She’s back to herself this morning, ready to go again. After all that running on rocks, you’d think her paws would be worn through, but she’s incredibly tough. Her nails are worn down, but her footpads look perfect! What a tough little lady she is. While at our Grant Spring campground the next morning, I re-stocked up my saddlebags with food and water and left them on the ground beside the trailer tack room while I fetched my horse from his morning feast on the well-watered grass. When I returned, I noticed that one side of the pack’s velcro had come open, my little Ziploc of Ibuprofen lay on the ground, and a my packet of crackers was missing. I could only conclude that someone had neatly reached in and helped herself. Daisy soon proved me right. She showed up happily munching on the cracker wrapper… Ah, well. I suppose she was hungry. True, she had already eaten all a generous amount of dog food, but she HAD gone at least twice the distance the horses traveled the day before – which put her in the 30-40 mile range. No wonder she’d worked up a bit of an appetite. Since we’d seen at least 3 trailers pass on the road that morning, headed toward the limited parking at the official trailhead, we decided to leave our trailer at Grant Spring and ride the extra mile from there. The first mile of the trail along Yellowstone Creek is the same as Swift Creek. After that, the 2 trails diverge. Yellowstone Creek trail crosses a stout bridge over the creek and heads uphill. Much of the lower part is alluvial, allowing for a little trotting here and there. About 4 miles up, the trail crosses a scree slope, where someone has arranged the rocks into steps that allow relatively easy horse passage. The path remained rocky off and on after that, but not nearly as bad as Swift Creek. We met 3 groups of horsemen. Two of them seemed to be families riding a mixed bag of horses and mules. Daisy decided to lick the privates of a mule names Herbie. He instantly cocked his leg in readiness to kick her lights out. I called her away in time and fortunately for her, she listened for once. Her unusual obedience may have saved her from a bad injury. The third group was an organized pack trip with 4-5 pack mules and 8-10 riders. We also saw two women hiking back to the trailhead carrying large packs. They could easily have camped for a week with all that gear. As we passed one of the scree slopes, a marmot whistled at us. I snapped a photo, but I wasn’t close enough to get a good pic. 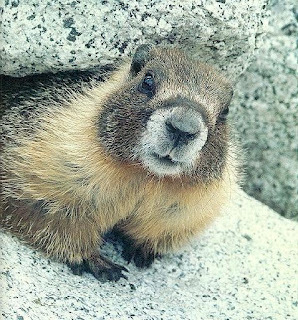 This marmot was snagged off the internet. The Yellowstone Creek had beautiful pools but we observed only a few small fish. The creek is undoubtedly heavily fished by campers, horsemen and hikers. Our plant finds included black elderberry, with the berries still red: I took a photo of Englemann spruce to show how its underbranches droop and the cones hang down from the top. Under the spruce trees, we found woodland pinedrops. These have no chlorophyll. They’re a parasitic plant that lives on soil fungi. That left plenty of time to drive the hour and a half home to Roosevelt and arrive in time to pick our overactive garden and throw a steak on the grill.